Barry works full time as a Section Manager for an authorised electrical network operator in NSW and predominately trades the top 150 stocks on the Australian market in his free time. He left school at the age of 16 to undertake an Electrical Fitter Mechanic apprenticeship and has worked for the same company for 39 years. Barry has been trading for the last 12 months and with what he knows now having completed the courses with Wealth Within, his prior efforts were more about being an investor rather than a trader. 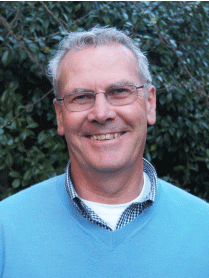 Over the last few years, Barry has been the Treasurer of a local Baptist church and he is currently on the leadership team of a new church ‘plant’ in Oran Park, which is in Sydney’s south west growth sector. Through the lifestyle that trading can create, Barry hopes to be able to dedicate more time in the future to being of service in his community. I first became interested in trading about seven years ago with a view to invest for the long-term and decided to set up a trading account in preparation for being able to transition from full-time employment into semi-retirement. Once I had set up the trading account, I had no idea of what to buy. The bank I used to operate the trading account had an offer for first time traders, where they would buy ten stocks for you, free of brokerage, to get you started. It was a bit like a chocolate wheel. I had no idea what I was getting, whether they were good or bad stocks, trending up or down…. Nothing. Consequently, I decided I needed to learn more about trading shares and started watching the Sky Business channel. While watching Your Money, Your Call I came across Dale Gillham and found that his down to earth and straight forward explanations struck a chord with me. I started by reading his book “How to Beat the Managed Funds by 20%” and initially used this information to start trading. Since then I have undertaken the Wealth Within Trading Mentor course, Diploma of Share Trading and Investment and by the time this goes to print I will have completed the Advanced Diploma in Share Trading and Investment. I am often asked "do I have any good tips" once people know what I have been studying and my answer is always…. Yes, get yourself a quality education in share trading. To me getting a quality education is akin to the analogy of giving a man a fish versus teaching a man to fish. Yes, the first mistake was the “chocolate wheel” approach to buying shares I described above. I am fortunate that after this first experience, I started to trade blue chip stocks and overall made small profits, but that was primarily due to good luck than good management. Predominantly, I would define myself as a mechanical trader. I’ve learnt that using a structured back testing process on stocks to determine clearly defined trading rules has allowed me to understand what works and what doesn’t. It also provides a solid foundation on which to make controlled changes in the future to refine my trading plans. Being a mechanical trader also helps with managing my psychology by knowing that I have tested my trading rules and understand the likely win/loss ratio and profitability of the trading plan that I am implementing. Once I gain more experience and develop my understanding of the character of individual stocks, there will be room for more discretionary trading decisions. However, this would be based on initially having a sound foundation of mechanical trading rules. The team at Wealth Within have been my mentors in this journey. Taking part in online student forums, online Diploma and Advanced Diploma forums, educational forums and the podcasts they facilitate and produce continues to give me insight as to what is possible and how to think like a trader. Also, the annual ‘Art of Trading’ workshop is like an annual booster shot. You get access to the Senior Analysts, Assessors and staff throughout the weekend as well as meet like-minded traders at all levels of education and experience. These role models have built and moulded my understanding of the share market and given me the confidence that share trading, if treated like a business with a solid plan, is a pathway to financial independence. They have also helped me develop a trading style that suits my nature, personality and current level of knowledge and experience. My trading style is quite conservative. Since I am working full time, slower moving, medium to long-term trading strategies best suit my available time and my nature. I think this style also complements my current psychology, but I know this will change as I gain more experience. Several trades have had a profound effect on my development, most for the same reason. I could see stocks going up in value and I was sitting on the sideline because I hadn’t performed the appropriate back testing to develop sound trading rules. You may call it greed or in gentler terms a "fear of missing out". I eventually entered trades before I had done all the homework necessary. In most cases I was fortunate, but there were a couple of trades where if not for having a stop loss in place, I could have lost more money than I was comfortable to lose. Since this time, I have not entered a trade unless I have done all the groundwork needed and the correct trigger has presented to enter. This taught me the importance of a proper risk management process. The worst trades would be akin to what I have described above, in not doing the ground work and taking inappropriate risks with my capital. The best trades are where I have stuck to my trading rules, regardless of whether the trade was profitable or not. There is one recent trade that I was extremely happy with, as it demonstrated that the skills I have gained are now developing into real competency. The trade involved Charter Hall (CHC) earlier this year. 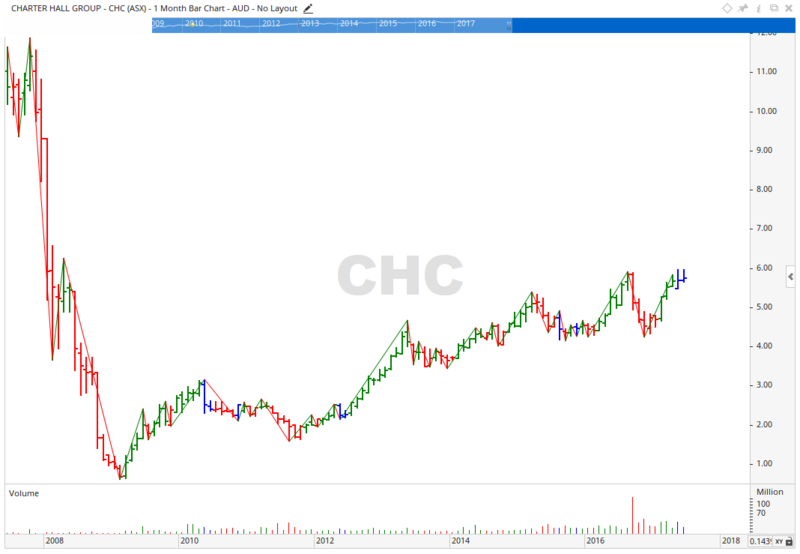 You can clearly see on the monthly chart how CHC is cycling within a long-term uptrend. After back testing, I determined that a trend line entry with both the weekly and monthly swings pointing up was a successful strategy for entry. Quite often after the uptrend finishes, CHC would fall back sharply and not give an early trigger to exit. It had, however, traded above the 61.8 percent price extension of the last two major ranges. Therefore, I was determined to set a tight stop loss under each up bar once CHC reached this target level. A neat, short, profitable trade that demonstrated to me what is possible. I am currently operating two portfolios - one in my wife’s name, as she is no longer working and one in my name. My wife’s portfolio is based on long-term trading, but the portfolio in my name is more short-term, where I am exploring different strategies and enjoying the challenge of understanding the character of different stocks. Longer-term trading with blue chip stocks is much better suited to inexperienced traders and those who have limited time as this area of the market tends to move slower and is very liquid. As a result, this is where most of our capital is invested. The shorter-term trading portfolio is something I want to grow as time and experience permits. It takes more time to manage these trades and you really need to get the right knowledge and develop your skills in slower moving stocks first. At this point, I don’t really have a favourite market, except to say that I am looking forward to trading more of the mid-cap stocks on the ASX with shorter-term timeframes, i.e. up to three months because of the additional volatility of some of these stocks and the opportunities it presents. I guess I am not really sure how other people trade, but in a nutshell, the way I have been taught to trade is to use fundamentals to determine what to buy and then use technical analysis to determine when to buy and when to sell. I like this approach; however, I was also taught that I can choose my preferred style or approach from the knowledge I have gained. In determining my trading rules, I use back testing to decide on the entry and exit rules that will meet my win/loss and profitability targets for a specific stock. 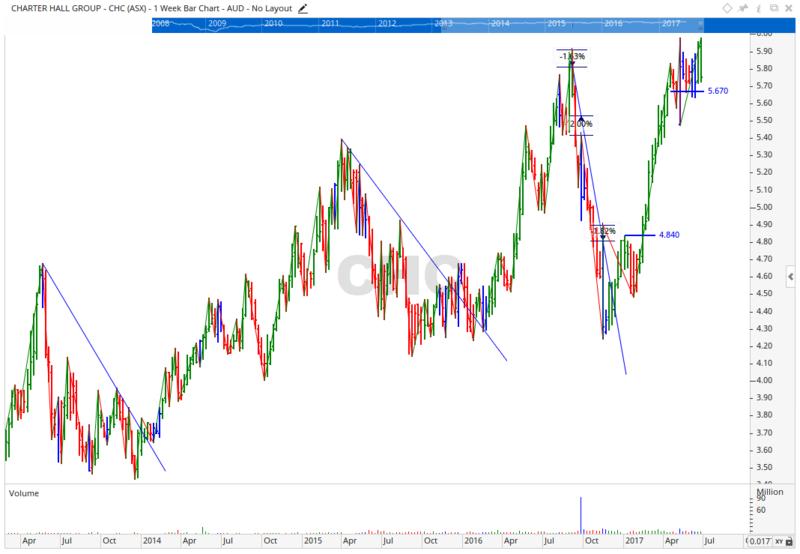 Overlaying this is price, time and pattern analysis to predict where the stock is likely to move to in the future. My favourite trading rule is actually a combination of rules designed to protect capital. Part of this includes to only invest between 10 to 20 percent of my capital in any one trade, never risk more than 2 percent of my total capital in any one trade and always trade with a stop loss in place. This combination of rules ensures that I am here for the long haul, especially when trades don’t unfold the way I envisage. The first thing I got from the markets was an education. The market will do what the market wants. All I can control is what I buy, when I buy and when I sell. What I am getting from the market is experience and an understanding of the possibilities the market presents. What I want to get from the markets in the future is a change in lifestyle. I see this as quite a tangible thing. As long as I apply what I have learned, there will be an end result. My lifestyle has not changed yet, I am still working full-time as a Section Manager, managing 60 staff, building and maintaining high voltage electrical infrastructure in NSW. However, I have a clear understanding of how my lifestyle is likely to change in the future. Moreover, it has created an additional income stream to enable me to give generously to others. I can also clearly see how trading will allow me to retire from full-time employment earlier than I might have otherwise planned. One book I highly recommend is “The Richest Man in Babylon”. I also gave this book as a gift to each of my two adult children as it gives sound financial advice in a story format that is easy to understand. When it comes to seminars, for the past for years I have attended the Wealth Within ‘Art of Trading’ workshop. This is a weekend commitment on an annual basis for existing and past students where we have the opportunity to learn from the senior analysts, assessors and guest speakers. My overarching vision is to become financially independent so I can create a lifestyle which affords me the time and finances to support and serve; my wife, both hers and my aged parents, our son, his wife, our daughter and our local church and community, as well as having time to travel with my wife, spend time in the garden and play golf and fish with friends.